Falls in the elderly are a serious health issue and a new study finds that Pilates might be a great way to prevent such injuries. 3 million seniors go to the emergency room for injuries from falls, annually. Each year, 800,000 seniors are hospitalized from brain injury or hip fracture from falls. In 2015, the US spent about $50 billion on treatments for falls. There can be many different causes of falls in older individuals.2 Certain medications can cause balance problems or dizziness, as can high blood pressure. Environmental risks, such as throw rugs or uneven floor surfaces are another factor. But the most common cause of falls is gait and balance problems, and this is where Pilates can help. 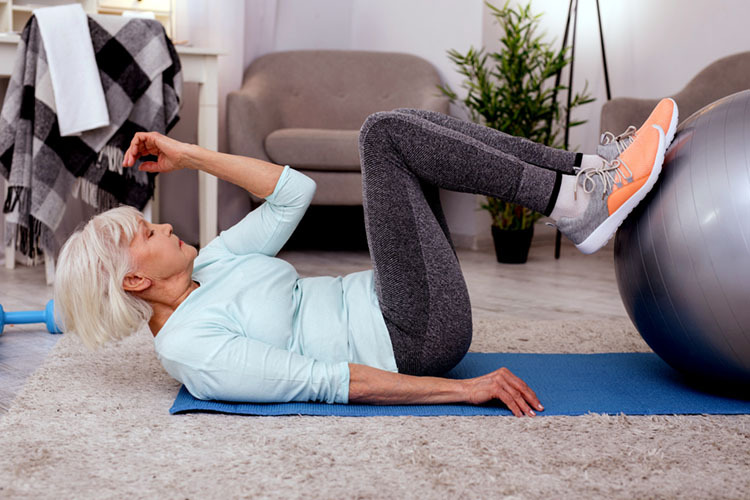 This new study3 was conducted by a team of California researchers, and they set out to see if the elderly could benefit from Pilates, especially looking at the improvement of balance. The study involved 55 individuals 65 or older. 27 of those people were enrolled in a 10-week Pilates reformer group class; the other 28 people were given no treatment. All of the test subjects were evaluated throughout the study on a number of tests that measured strength, flexibility, and balance. This study confirms what other research has found. A 2015 study found that Pilates helped older women improve their health and balance, and a 2017 study from Brazil found the same. Other research shows that Pilates provides many benefits for people, including help with chronic pain, strength, and quality of life improvements. When combined with improved balance, it seems like Pilates is the perfect way to stay fit and healthy as we get older. Thompson HJ, McCormick WC, Kagan SH. Traumatic brain injury in older adults: epidemiology, outcomes, and future implications. Journal of the American Geriatric Society 2006 Oct;54(10):1590-5. Review. PubMed PMID: 17038079; PubMed Central PMCID: PMC2367127. Cuevas-Trisan R. Balance Problems and Fall Risks in the Elderly. Physical Medicine and Rehabilitation Clinics of North America 2017 Nov;28(4):727-737. doi: 10.1016/j.pmr.2017.06.006. Review. PubMed PMID: 29031339. Roller M, Kachingwe A, Beling J, Ickes DM, Cabot A, Shrier G. Pilates Reformer exercises for fall risk reduction in older adults: A randomized controlled trial. Journal of Bodywork and Movement Therapy 2018 Oct;22(4):983-998. doi: 10.1016/j.jbmt.2017.09.004. Epub 2017 Sep 9. PubMed PMID: 30368346.